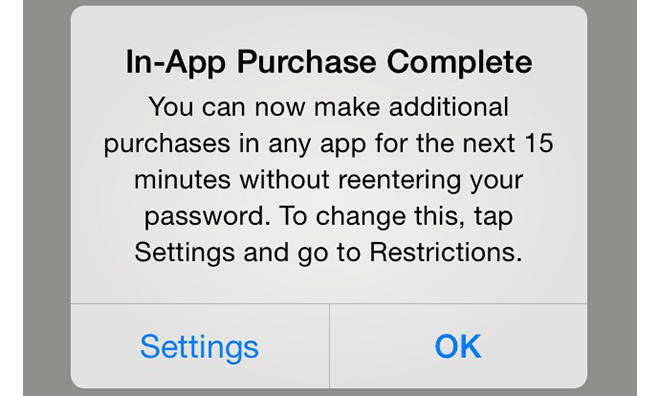 Apple is making absolutely sure that its users are aware there's an open 15-minute in-app purchase window where no password is required once an initial purchase is made. The pop-up is in an effort to stop users from mistakenly racking up large bills because of said window. Apple actually had to settle with the FTC because of its previous implementation of in-app purchases. The new message pops up in the company's latest mobile update to iOS 7.1, which just started rolling out this week. The 15-minute rule has been in effect as far back as 2009, though Apple is ensuring its users know the store's policy. As you can see from the screen cap above, the message is very clear. Users can change this setting, but otherwise by clicking OK you agree to the 15-minute window. While the short in-app purchase window is meant to be convenient by foregoing having to input a password, people have managed to rack up some pretty hefty bills thanks to the freemium model. Some apps, such as Clash of Clans, are making a killing thanks to in-app purchases, while some consumers are racking up bills in the thousands. In the FTC ruling earlier this year, Apple was ordered to pay $32.5 million in refunds as settlement. Apple, of course, wasn't happy with the ruling; the company had previously worked with customers who fell "victim" to Apple's 15-minute in-app purchase policy, reaching out to 28 million App Store customers who had made in-app purchases in a game designed for kids. This latest effort by Apple is meant to ensure parents are very clear about what policies are in place, and that the setting can be changed.